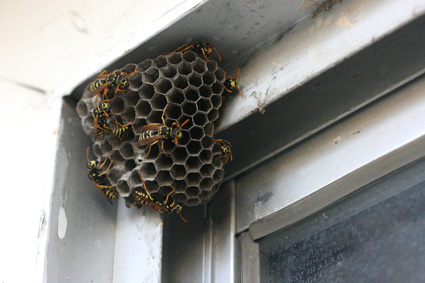 Have you had enough of wasps that have built a nest on or near your property or home? If you’ve been dealing with dodging the wasps that fly to and from their nest outside your home or business, it’s time to call in the wasp removal experts in MN. At Eco Tech, the top Minnesota natural pest control and pest removal service, we use an all-natural method to remove wasps in order to keep you safe in more ways than one. You might have noticed a wasp nest up high on the exterior of your home or building. Maybe you’ve seen them buzzing around outside areas where you like to spend your time. Some bees are known to build nests underground, and surprising them while doing yard work, or having your kids or pet innocently play near their underground nest can be very dangerous. While you may think you’re safe from wasps, especially when they live higher up, there are important facts you should know about wasps. Not only are wasps nests unsightly, but the wasps themselves pose a threat as they have the ability to sting. Some species of wasps are aggressive and will sting when provoked or threatened. Wasps are capable of stinging multiple times, unlike honey bees. There’s no need to allow wasps to threaten your safety, call Eco Tech for safe, natural wasp removal services in MN. When you contact Eco Tech to tackle your wasp problem, our professional team member will inspect your problem area. Once we’ve identified your wasps and the location of their nest, we will formulate an effective treatment plan that includes safe removal of the wasps and we’ll keep them from returning. Are you looking for a natural pest control for wasps in the Twin Cities Metro area? Our products are not harmful to the environment, which means your kids and pets can continue to safely play and spend time outdoors, with no threat of poisonous chemical sprays. If you are having a problem with wasps in the Twin Cities Metro area and you’d like an inspection of your business or home, contact us today by calling 763-785-1414, or click here to complete our online contact form.